In addition, the dentalvault™ provides a permanent storage location, that hides appliances in plain sight, while providing the perfect storage and cleaning container. The elegant appearance of our product enables you to use it anywhere in your home, or when traveling, without calling any attention to it. Perfect on your nightstand, in the bathroom, or anywhere that is convenient to you! Join those who testify to its' simplicity, and regain your self-confidence, and privacy! Night appliance storage is also about protecting your financial investment from loss, or mis-placement...dentalvault's™ unique unbreakable polypropylene two-part construction helps to provide a permanent home, as well as keeping them fresh and hygienic.The disadvantages of storing your appliance in a glass are significant. Our engineering grade plastic construction is virtually unbreakable, as opposed to glass containers, which create a potential hazard when dropped onto a hard floor. Secondly, it is difficult to remove your appliance from a glass without spilling out your valuable night guard, or sleep apnea device (snore guard) cleaners. 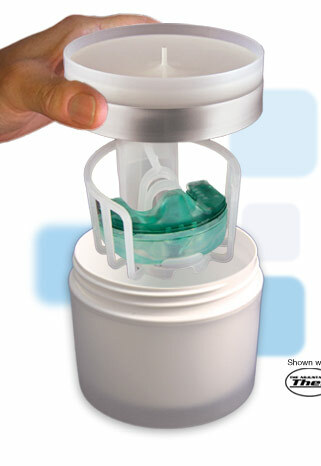 Our two-stage telescoping dental basket provides easy hand access, while suspending your removable appliance off the bottom of the dentalvault™ container, allowing your favorite cleaners, or disinfectant to circulate freely around the appliance for a thorough cleaning. Our test cycle data has also shown a reduction of appliance breakage during wet, and dry drop testing onto a hard floor surface, adding safety as well as beauty to the list of advantages, making the dentalvault™ a wise investment to protect your removable appliances for years to come! For all bruxism, or sleep apnea device (snore guard) wearers, the dentalvault™ is a logical alternative, and solution to the practical realities of wearing removable dental appliances. We are confident that you will share in our enthusiasm that this transformational product creates, and liberates you from the negative associations associated with wearing evening dental appliances!